Details are emerging of a Royal Navy / Royal Marines operation against Pirates in the Somali Basin. On Friday May 14th, whilst on patrol as part of a NATO maritime task force, HMS Chatham's Lynx helicopter spotted a larger vessel towing 2 smaller attack boats, approximately 150 miles off the coast of Tanzania. These suspected pirate vessels were kept under surveillance overnight until, at dawn, they were intercepted by Royal Marines and Royal Navy personnel. The Royal Marines, most likely from the Fleet Protection Group (FPG), moved up to the pirate flotilla in Rigid Inflatable Boats (RIBs), with Chatham's Lynx helicopter providing cover overhead. As the Royal Marines approached the boats, their passengers could be seen throwing weapons and other piracy-related equipment overboard. The Royal Marines boarded the pirate vessels and discovered 10 Somalis and a large quantity of fuel on board. The suspected pirates on the smaller craft were then moved onto the larger one before HMS Chatham and its Lynx destroyed the 2 attack boats. The Somalis were left with just enough fuel on their boat to reach shore and were sent on their way. The Royal Marines involved in this operation were stationed on HMS Chatham, a type 22 Frigate. The warship is the flagship of a Standing NATO Maritime Group - SNMG2 - which patrols the Gulf of Aden and off the Horn of Africa. HMS Chatham can carry up to 2 Lynx HMA 8 helicopters. 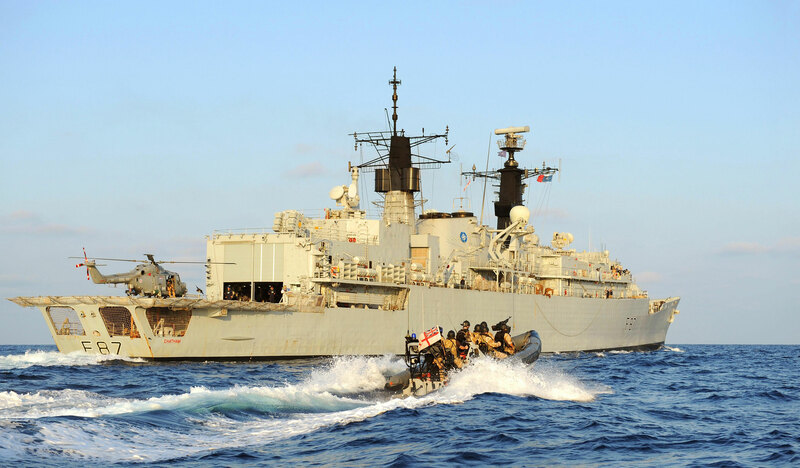 21.04.2009 - Royal Navy personnel on board Royal Fleet Auxiliary (RFA) Wave Knight thwarted two pirate attacks on merchant vessels in the Gulf of Aden this weekend resulting in the release of 13 hostages.